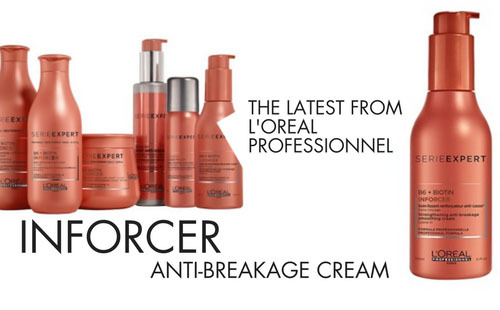 The latest from the innovators at L’Oreal Professionnel, the INFORCER Anti-Breakage Cream, is a favorite of Studio Owner and Master Stylist James Geidner! It’s formulated for normal to fragile hair and is infused with vitamin B6 and Biotin. This product provides instant detangling, strengthens your hair and helps smooth strands for stronger hair that is easier to brush and style. This duo of star actives, Vitamin B6 and Biotin, is found throughout the Série Expert Inforcer range—not only in the anti-breakage cream but also the shampoo, conditioner and mask, which are all no-rinse products. They are also at the heart of two other products: a brush-proof spray and a night anti-friction serum. Not sure if Inforcer is right for you? Our stylists will assess your hair’s needs and address your concerns, so as to recommend an at-home hair care system that will allow you to enjoy your best look yet!